« Calling All Tuckers…What Are Your Best Tips to Keep Shirts Tucked Neatly? For $350, this is not speaking to me. I am sure that Corporette is far too fabulous to lug around big files, but for me, it looks like the pouch would barely fit my lap top, let alone any file materials. I do think that the color is great take on neutral. I love using deep reds, bright pinks and emerald greens, which I find go well with brown, black or navy. Beautiful color, and I like that it’s made to go cross-body – I’m not a fan of big shoulder bags – it’s just not practical to put the weight of a computer and files all one shoulder. That said – $350 is a lot of money for a bag to lug around files… and I’m not sure that I wouldn’t get tired of the color fairly soon. You know… It’s Earth Day. It wouldn’t have killed you to feature a vegan bag (like Matt & Nat ones currently on sale at Gilt that’s made out of recycled plastic bottles). Just sayin’. That leather comes from some seriously polluting cows, you know. OMG. Start your own blog, don’t dictate what other people should write! What’s the big deal? People often suggest alternatives to the featured items. I don’t mind seeing some non-leather bags, and while Lawchic’s phrasing could have been a bit less judgmental, I don’t think she did anything wrong. And I liked AIMS’s suggestions. OMG. That first passchal bag is beautiful! It wouldn’t have killed you to be polite about suggesting vegan bags either. Come on ladies, this is supposed to be a place for ideas and support, not for judging others. This is fab. $350 is a good deal for Kooba. reads very “fall” to me. cute bag though. No way that berry is a neutral! I mean, love the color, but really? I own a berry coloured bag, and it goes with almost every colour I wear (except true red & orange)! Sounds weird, but is true…Black, grey, navy, white, all blue shades, purple, emerald green….the list goes on. A total neutral! It does look more fall to me, though. But great color. I’m trying to hold off on major purchases for a while, but I was VERY tempted by this. It has enough detail to be interesting, but not nearly as much as the overwrought, excessively-heavy, oversized-for-no-apparent-reason purses that seem to be everywhere these days. I am in PHX and it’s HOT here in the summer. I’m looking for something that reads like a suit, but is more informal. Thoughts? Big fan of the khaki suit. I have one from Tahari and another I got at Banana Republic a few years ago. I’m not crazy about these Talbots pants, but if they work for your figure I say go for it. Sateen doesn’t seem like a summer fabric to me. I think I’d prefer linen, or maybe a silk blend. My comments have been getting eaten – not moderated, just disappearing and not posting when I hit submit. When I try to repost it says “duplicate comment detected.” Not sure what’s up. very odd — can you remember what you tried to type (like exact words), or on which posts? i wonder if they’re going in the spam filter — haven’t checked that in like a week. email me at kat at corporette dot com. thanks! It was this exact post, except not broken up. It’s happened to me before although I don’t remember what I was posting. Since there were so many links, it’s entirely possible this one got marked as spam. Maybe I’m the only one, but I think those pants are super cute. I think the pants are cute too. But they do look like most of the pants my (fashionista) mom wears. Ooo, I really like the style of this bag! The hardware is classy and interesting, although I prefer silver tones. Lovin’ the cross-body strap especially. 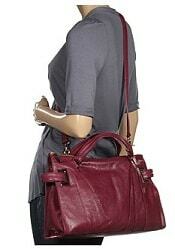 My nice leather tote has regular shoulder straps and after carrying anything heavy, I really feel it in one shoulder. While I agree with others that the color is quite neutral, I find I tire of anything other than black over the long haul. For less expensive bags like seasonal purses, that’s fine, but a tote like this at this price, I want it to last many, many seasons. Or maybe it’s just that this deep berry/oxblood color was very trendy when I was 13 and I’m having middle school flashbacks. Love the smell of good leather… Glad I’m not the only one! Maybe it’s just me, but I really don’t care for any kind of bag — and it’s usually totes and briefcases — that have handles to carry the bag by hand, PLUS a detachable shoulder strap. I can’t stand the flimsy-ness of the shoulder strap, and I can’t stand the fact that the hand straps stay there when you’re using the shoulder strap. If I want a bag to put over my shoulder, I want a permanent substantial shoulder strap, and I don’t want any hand straps to get in the way. but I’d rather spend $350 on 5 bags that live only for 3 years than on one that I am gonna get bored of and can hang out for 10 years!